The City of Tshwane said it would not buckle under pressure and give in to the demands of the Economic Freedom Fighters (EFF), who want the Paul Kruger statue removed, or those of controversial Afrikaans singer Sunette Bridges, for it to stay right where it is. 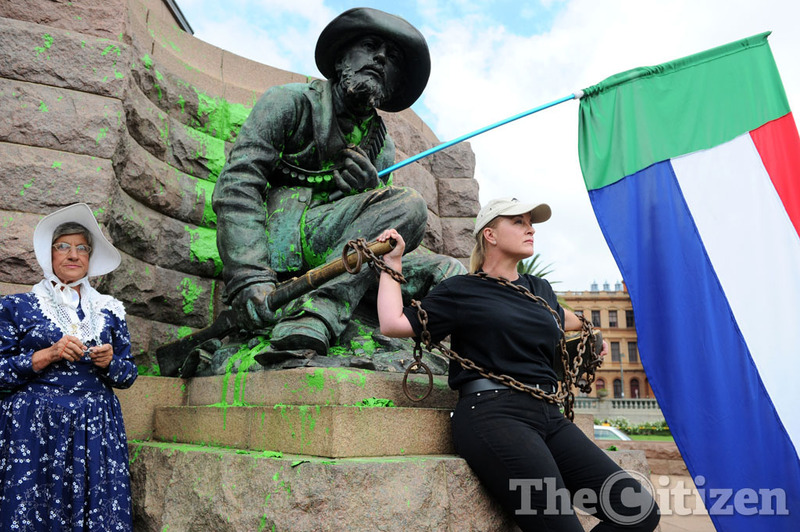 On Sunday, the Kruger statue, perched in the centre of Church Square in Tshwane and surrounded by four Boer soldiers, was defaced with green paint, allegedly by EFF members. This prompted Bridges, backed by political party Front National, to stage a sit-in on Wednesday. She chained herself to the statue and demanded that it, and other heritage sites, be left alone. Bridges said they wanted the city to know “we will not stand for the destruction or even discussions about the removal of the statue of Paul Kruger from Church Square”. Minister of Arts and Culture Nathi Mthethwa said they had not yet received any formal application for the removal of any statue in any part of the country. He said the government’s policy for all heritage sites was based on reconciliation, nation building and social cohesion.